Percentage-wise the importance of your intention (what you want) is 30%, your energy and connection is another 50% and the ritual is only 20%. The ritual is the servant of your intention. Ultimately, it doesn’t matter what you do but HOW you do it. For example, if you want to improve your relationship or find a new partner you could hang a chewing gum in the relationship corner of your bedroom and it will work. Of course, it’s better to place something nice and beautiful and thematic such as a heart prismatic crystal or a romantic picture. Be very clear what you want. You need to be specific enough and open at the same time about your goal and purpose. Please note that there is a difference between your goals and your purposes. For example, your goal might be to have a successful business online. But your purpose will be to 1) set up a website 2) optimise with SEO 3) build a brand 4) build a strong community online around your brand, etc, etc. So the goal is the final result and the purpose is the steps you going to take to get there. Another example, your goal is to win/finish London marathon and your purpose would be to run for 30 minutes every day, in the morning, for the next three months to prepare for the marathon. Learn how to set up a SMART purpose (Specific + Measurable + Achievable + Real + Timed) and write it down (which is always the first step in manifesting your intentions, from the virtual reality of your mind to your immediate physical reality) and then do some feng shui to optimise your environment to help you with that purpose. Knowing what you want and how is half of the success. If your energy level is low then you might experience problems with manifesting your goals. With a strong personal energy, you don’t have to put much effort into your intention or the feng shui ritual. Sometimes a weak intention and minimal feng shui ritual work better since subliminally you’re not so attached to it. Your energy is a link between your intention and the ritual. It is the relationship and the meaning-making between the virtual world and the physical one that will make it work. • Your values (what is important to you) are key energetic drivers so figure out what are your values. Write them down in order of importance. For example, 1. Health 2. Love 3. Family 4. Success 5. Reputation, etc. If what you want is not in your values list then you might have problems in manifesting it. It’s very revealing that the most successful and wealthy business people have ‘money’ quite high up on their value list. • Feng shui of your home is a prime environment where you can boost your energy. Check your home for sick building syndrome aspects such as geopathic stress, electromagnetic pollution, etc, and all the usual feng shui things. • Look after yourself and build your chi through organic foods, exercise and meditation (this is Deepak Chopra formula for a happy and successful life). • Learn how to manage stress through meditation (Big Mind), the power of letting go and tapping / EFT (emotional freedom technique). • Learn how to become luckier – that is to be at the right place, at the right time, doing the right things. There is a scientific way to get lucky. HOW? (hint: you need to be in the right lucky mindset). 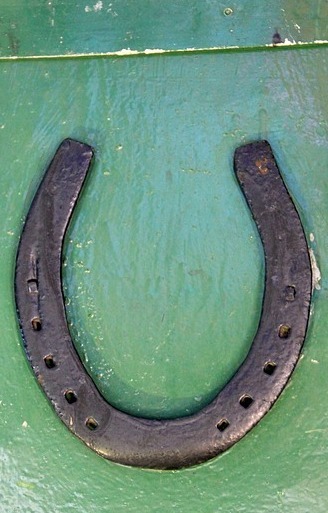 The way to hang the horseshoe is up like the letter U so it works like a container for your luck. Some feng shui rituals work better than others because they have a stronger morphic field ie a lot of people believe and use them. For example, hanging a horseshoe above the door has been practised for centuries and it works. “I understand that it (feng shui) works whether you believe in it or not.” said Niels Bohr, Danish Nobel Prize winner in Physics, when asked why he has a horseshoe above his door. Beliefs are perceptions about how things work and the science behind how beliefs work is called placebo effect. 1) Decide what you want and how. 2) Write it down as a SMART purpose. 3) Anchor the intention in your environment with a feng shui ritual that is representative in some way of your intention. Read some feng shui tips for ideas. 4) Do some first steps in order to manifest it (using your SMART purpose) and follow through until you realise your goal. Never give up. Determination, persistence and patience will get you there. Posted in Feng shui philosophy, Feng shui principles, Feng shui remedies, Feng shui tips, Feng shui wisdom and tagged How feng shui works, Placebo.